These are two of the bigger fixed blades in my collection. What I'd call doomsday knives or zombie killers. The top one's a Custom knife made for me by Bones. o1 steel with a beeswax coated, cord wrapped handle. The bottom one's a ZT Tooth with 6150 spring steel and leather wrap handle. 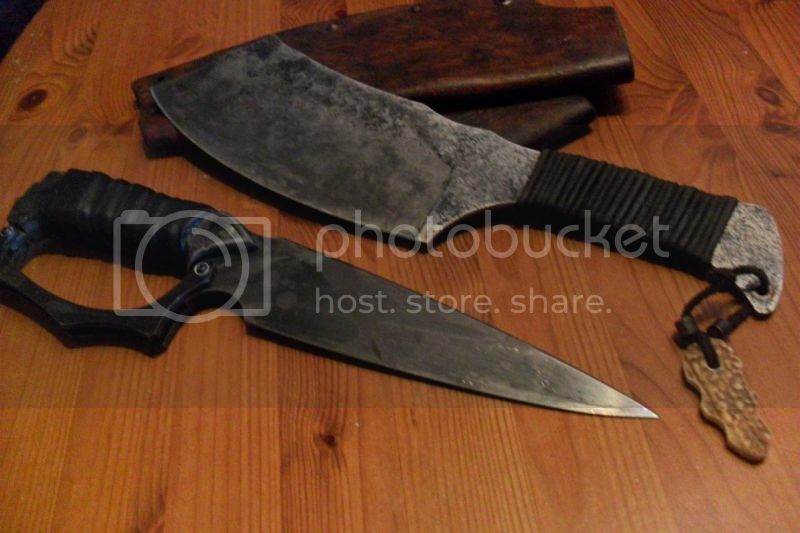 Both knives have been given a forced patina to make them look "weathered". Here's a better picture of the Bones cleaver. 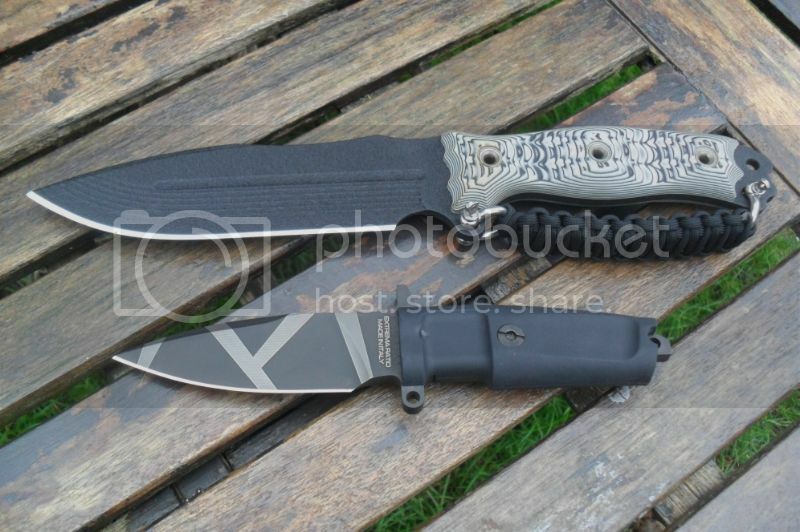 Another two; a Busse Hell Razor with a custom made paracord handguard and an Extrema Ratio Shrapnel. I hope you like them. I'll post some more pictures if anyone's interested in seeing some more. Mr Bones makes some great knives, from the simple and rustic to the very shiny and elegant. That ZT 'Tooth' looks a tad illegal to me even though the knuckle guard is removable. The hand guards shipped separately and I admit, they are a bit naughty, but legal to own if kept in the house as far as I can make out of British law. Yes, bones does some blinding work. I've got a couple of Ru Titley's pieces which he did the heat treatment on and they're all stellar cutters and he's a great bloke to deal with. 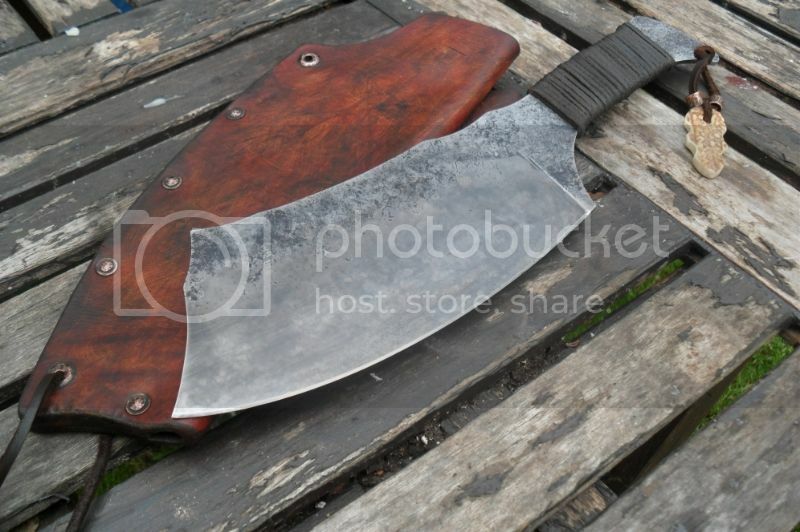 also LOVE the cleaver!!! take about a basic utility blade i believe that would anything you asked of it amd then some!! Who is this "bones" that you speak of?